Waking Up is a difficult book. You may be tempted to assume, by its conspicuously short page length and tranquil, sky-blue cover, that it will be light reading, but light reading it is not. Sam Harris, author, horseman, skeptic-extraordinaire, has set out to discuss the inherently difficult topic of the nature of consciousness, particularly in its relation to contemplative practice and – for sad lack of a better word – spirituality. For the novice (and that’s me), digesting the non-duality of consciousness and the elimination of self made for a tough, but enjoyable journey. I’ll spend the next few minutes discussing why I felt it worthwhile. First, a little more on what I mean by difficult. It’s not that there are loads of technical descriptions or assumed knowledge by the author – it’s that the nature of what’s being discussed, subjective experience, is just hard to connect with. Consider this short excerpt: “Subjectively speaking, there is only consciousness and its contents; there is no inner self who is conscious.” It doesn’t matter how deftly or how many ways someone describes something like that to you, to grasp it at all you need to at least glimpse it yourself. Oftentimes throughout the book I felt like Harris was taking great pains to describe a stranger to me in physical detail, and then asking me to go out and find said stranger in a crowded gymnasium. Flatly, it’s hard, both for the teacher and the student. Harris is aware of the difficulty, hence the constant encouragements throughout the book to put into practice what he’s describing – to actually take time out of your day to meditate and practice mindfulness. The second complication is that one needs to have thought somewhat deeply about the nature of consciousness before, otherwise much of the book – particularly chapter 2 – will be difficult to comprehend (for a crash course on the “hard problem” of consciousness, I recommend Steven Pinker’s article in TIME). These two in combination had me on the frustrating edge of comprehension for much of the middle of the book, only to lose it all a moment later. Fittingly, this seems to mirror the experience of beginning contemplatives, who struggle mightily, for hours or even years, to take the first steps toward enlightenment. But struggles often lead to reward, and while I was initially skeptical of the book, I had that bittersweet feeling of melancholy as I finished its final pages, not wanting it to end. If nothing else, Waking Up has piqued my interest in contemplative thought and meditative practice – concepts I’ve dabbled with but never to any serious degree. Even if one reads the book and never again sits cross-legged on a cushion to meditate, there are useful self-help tips that can be applied almost immediately. For example, the basic act of mindfulness, or being aware of the present moment, can be used to assuage negative emotions and thoughts. The next time you are feeling angry, take a second to just notice that you are feeling angry. Just pay attention to the feeling. The same can go for anxiety, loneliness, etc. You’ll find that the act of awareness will almost immediately relinquish the negative effects of the emotion – it’s quite difficult to stay angry when you are concentrating on how angry you are. (I was happy to see this technique discussed, as I’ve been doing a version of it since I was a kid, without knowing it was connected to anything called mindfulness). Along with tips like these, there are also short descriptions and exercise on how to meditate (you can find Harris’ guided meditations here), backed up by evidence supporting the health benefits, which are primarily cognitive. At its core, that’s what Waking Up is – a self-help book. Harris, who seems to have led an interesting life traveling far and wide in search of transcendent experiences, is here relaying what he’s learned – all within a rational framework – simply because these practices interest him and have helped him personally by reducing, not entirely but in small bits, suffering. Perhaps most importantly, Harris has staked a very public claim on turf formerly thought to be the exclusive domain of the religious (or at least the wacky). 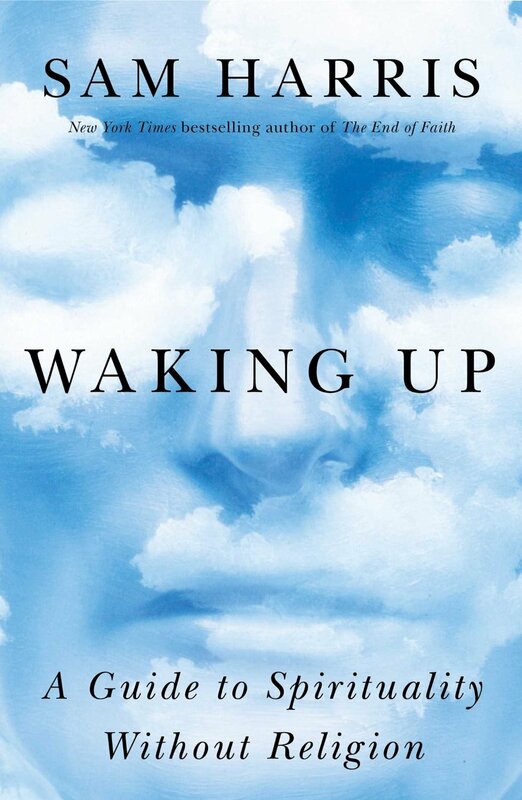 By writing Waking Up, one of the most famous skeptics of our generation has swiftly divorced the meditative and contemplative practices from their traditional, often irrational foundations in Eastern religion and co-opted them into a rational framework aimed at inducing psychological well-being. It’s perhaps not surprising that, old as they are, some religious traditions have managed to make insights into human happiness and suffering, and once we slice away the supernatural baggage, there’s something left that even the fiercest skeptic can find useful. The old idiom, “even a broken clock is right twice a day” passed through my mind more than once as Harris summarized religious traditions dealing with enlightenment and transcendence. In addition to self-help, the overriding theme of the book is that one doesn’t need religion to lead a spiritual life. This, I think, is particularly important today as more and more people question the foundations of their religions but do not leave due to the perception that humanism, skepticism, atheism, etc are devoid of transcendence or spirituality. Harris’ book then, is timely, and I hope an inviting argument for those who feel they have been missing something in their lives since leaving religion, or for those who haven’t yet left. Of course, some people have never felt a yearning for the spiritual life. And for those folks? Well, Waking Up is still worth the price of admission, if for nothing else than Harris’ 13 page take down of NDE-peddler, Eben Alexander (Dr. Heaven). While it doesn’t fit quite smoothly into the rest of the text (at times the book is clearly a mash-up of previously written material), Harris offers, next to Esquire’s piece, perhaps the most comprehensive criticism of Alexander’s ludicrous claims to have proven that we survive our deaths. If the premise of Waking Up seems too gushy for you, and you miss the good old excoriations of patent nonsense, then fear not: Sam Harris is still your guy. And with that, I (whatever “I” even means anymore!) end, and encourage you to read other reviews, or check out the first chapter, available for free online. Now, off to meditate. Namaste. Well, this was cool. Sean was nice enough to link to my summary of his recent Intelligence Squared Debate. The shout out resulted in a 1,300% traffic increase on this site compared to last month – not bad for the most amateurish of amateur blogs. The most touching aspect of all this attention? I noticed a complete stranger use my (admittedly uncreative) nickname, Dr. Heaven, to refer to Eben Alexander while commenting on a blog post. Maybe it will catch on. You can now find Sean’s thoughts on the debate here, and Steve Novella’s here. Sean Carroll is quickly becoming my favorite living scientist and defender of rationalism. He just posted another stellar public debate performance in the Intelligence Squared US series, arguing – along with Yale neuroscientist Steven Novella – against the motion, “Death is not final”. You can catch the full video below. I’m impressed by Intelligence Squared’s persistence in addressing deeply fractious issues like religion and politics. Sadly, not many mainstream outlets organize discussions on these issues, and I think they do a terrific job of having civil discussions on issues that are sometimes uncomfortable. The moderator, John Donvan, is pleasant, and the format is about as good as you can do for a formal debate (7 minute opening statements, questions from the moderator, questions from the audience, short closing statements). They also do a pre- and post-debate poll from the audience to determine the winner based on the percentage increase or decrease for or against the motion. Sean had near perfect answers in both his prepared and impromptu responses (including the memorable analogy of life being a process like fire and not a substance like air or water) . As one of the commenters on his blog, Preposterous Universe, said, Sean is basically batting a thousand when it comes to these things, and that’s not an easy feat, even when you have facts on your side. But after an impressive debut with Michael Shermer against Dinesh D’Souza and Ian Hutchison, and handily defeating everyone’s least favorite apologist William Lane Craig, and now this debate, Sean has cemented himself as one of the best public defenders of science and skepticism out there. He has a knack for being polite, funny, refreshingly clear and uncompromising, and non-threatening – all characteristics that open up people’s willingness to listen. This was my first exposure to Steven Novella, and I think he did a good job, but isn’t as practiced a public speaker. He also sadly had to endure an illegitimate poning when Dr. Heaven (more on him in a minute) misquoted the late Carl Sagan. Steven corrected the misrepresentation, and Dr. Heaven doubled-down by quoting a page number from A Demon-Haunted World (essentially the skeptic’s Bible) to boost his credibility, and it got a large audience cheer. Of course the quote was completely misrepresented. Carl Sagan never came close to suggesting there was legitimate evidence for paranormal activity (he just said there were some claims worth investigating, which any open-minded scientist would say). Novella called Alexander out on this, but it wasn’t as forceful and didn’t play as well with the audience. Now, onto Dr. Heaven (Eben Alexander). This guy burst onto the stage with a cover story in Newsweek maybe a year ago, where he claimed to have had an NDE that proved heaven was real. He then promptly wrote a book, Proof of Heaven, which has been on the best-seller list for quite some time, as one would expect. I suspected he was a charlatan immediately, and this debate more or less demonstrated that – he didn’t seem to understand modern neuroscience (a neurologist, after all, doesn’t necessarily have to) and just seemed to brush off Novella’s alternative explanations and refutations. He also suggested, at first a little sheepishly and then blatantly, that quantum mechanics and consciousness are both fundamentally related since they are confusing and that the latter led Einstein into mysticism (…no…). Most frustratingly, he made the brilliant argument (and I’m not oversimplifying here) that since we don’t perfectly understand consciousness, heaven exists. I was a little disappointed actually. I was hoping (as maybe we all do) that he might have more than personal conviction and bad reasoning skills, but that’s about all Dr. Alexander adds up to (and a little more initial credibility than your Uncle Bob because he was once a practicing neurosurgeon). For additional credibility he likes to tout that he used to be a materialist and skeptic, but I’m not at all convinced that he ever took those ideas seriously in the first place – his description of materialism reminded me eerily of those by religious apologists who you can tell don’t understand what they are talking about. If he had ever been a hardened skeptic, that part of his brain must not have turned back on after the coma, because this was 101 stuff. Dr. Moody, while a seemingly pleasant man, didn’t help his side much. He pontificated a bit dreamily on Plato and Democritus and seemed at times to be arguing with himself on where he actually stood. He also offered hardly any evidence at all (and certainly none that was compelling) for his stance – and this from a man who is supposedly the world’s leading expert on NDE’s. But I think Sean essentially won the debate by focusing on the following argument: if you believe in life after death, you are saying that established science is not just a little wrong, but very, very, very wrong, and that it has somehow escaped the notice of any experiment ever. The mind existing after the destruction of the brain is simply incompatible with what we know. He admitted that for him, it isn’t even an interesting question anymore because our understanding of physics (yes, including quantum mechanics, Eben) is quite straightforward and eliminates the possibility. He then closed eloquently and reminded everyone, as he’s done before, that life is not a dress rehearsal – it’s all we have, and that finite aspect is what gives life its meaning. Oh, and justly, Sean and Steven won the debate, improving the audience position against the motion by 15%, compared to only a 5% increase for the motion. A few days ago, I took a trip to a small town in central Texas and, as is habit, stopped by a local bookstore. 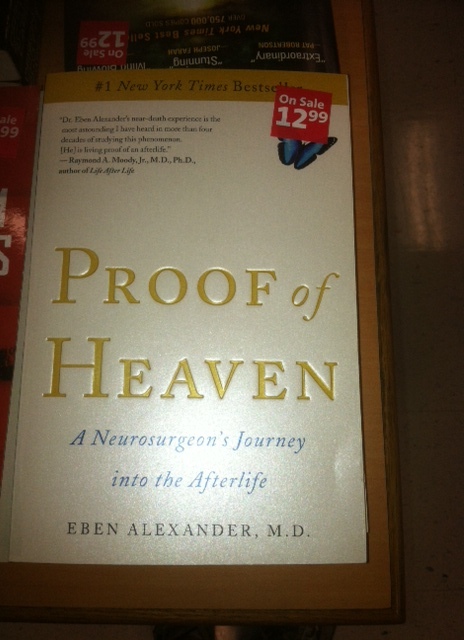 I was a little shocked (though maybe I shouldn’t have been) to find two fringe “science” books displayed prominently near the door: Stephen C. Meyer’s recently released “Darwin’s Doubt” and physician Eben Alexander’s “Proof of Heaven“. The rest of this particular bookstore’s science section, meanwhile, was suspiciously weak, relegated to one small wall of five shelves and containing only three or four volumes on Darwinian evolution. The Christianity section, meanwhile, stretched across six aisles. Meyer’s book, which I have not read, apparently advocates for Intelligent Design (a movement that should be categorized as religion, not science – see overview here, description of the Discovery Institute’s “wedge strategy” here, and if you have lots of time, a fantastic PBS documentary on the controversy here). Alexander’s book, “Proof of Heaven” is even more offensive as a representation of responsible science. You should first read his account here (he, like many others, had a NDE, or near-death experience, that he says proves consciousness exists outside the brain) and then read Sam Harris’ response here, which rightly decimates such a stupendous claim. The two most important points to remember – being a neurosurgeon doesn’t mean you actually understand neuroscience all that well (cutting brains is not the same as studying them), and being highly educated doesn’t mean you have much critical thinking capacity (since he wrote a book, he apparently emerged from his COMA, so isn’t it much more likely he had his NDE as he was regaining consciousness, and not while completely “brain-dead”?). Bookstores have no obligation to maintain a balanced inventory of material. They are businesses that need to cater to customer demands in order to make a profit and survive. But I can’t help feeling sad that customers in this particular location (and probably numerous others throughout the country) are in some way being cheated out of access to proper science and instead being fed garbage. I did the only thing I could think of – moved Meyer’s book out of the thin science section and put it where it belonged, in the middle of the Christian apology aisle (well, it was more of a wing).